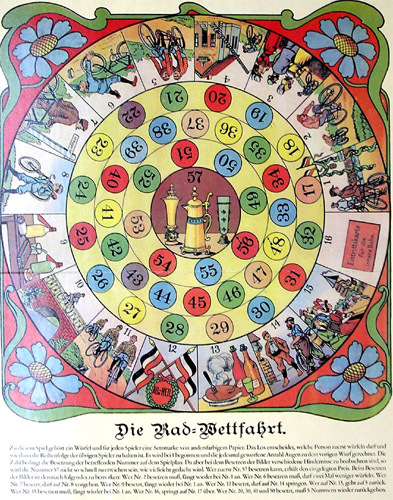 This is an old German game, of which there are at least two different German versions. 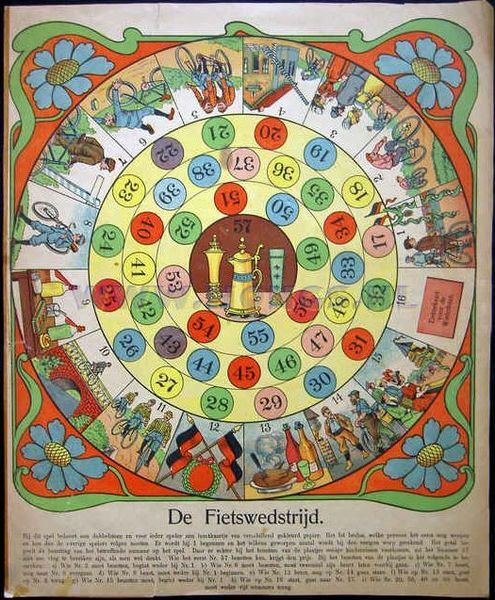 The game was also released in the Netherlands as "De Fietswedstrijd" (scroll down to see a couple of Dutch examples). 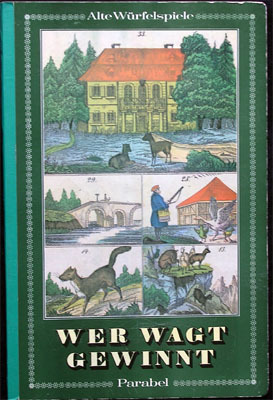 One of the versions of the game is quite well- known, since it is reproduced in the book "Wer wagt gewinnt: Alte Würfelspiele" (Parabel, Zurich / Das Kinderbuchverlag, East Berlin : 1985). It is a large (41 x 33 cm) print which was included in a multigame book. I have at least a game of goose of the same collection. 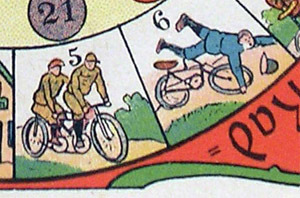 The cycling game is number 9558 (while the game of goose is nr. 8017). 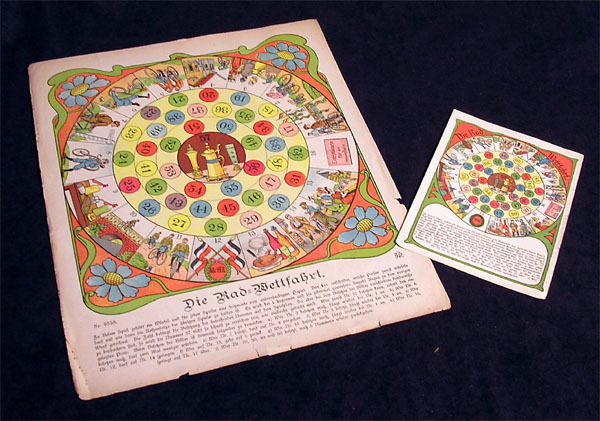 Both have a black and white mill board (aka Nine Men Morris) board printed on the back. 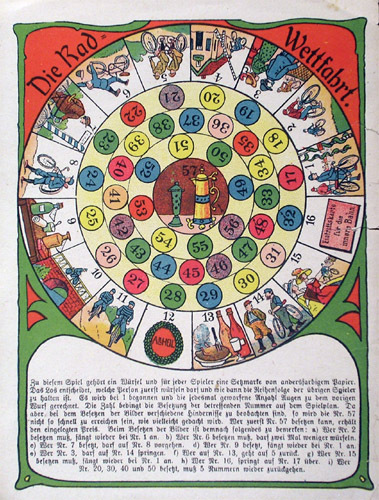 These books containing game boards (generally between 4 and 8) were not unusual at the turn of the century. 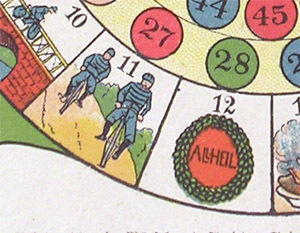 The second version of the game is a strangely small print (20 x 15 cm). At first sight both boards look quite similar but, on a closer examination, we see that the game was completely redrawn at some time. (The smaller print is on the left, the board taken from the book is on the right, all through this page). Here is an important detail: The flags on the right are the imperial german flags used until 1918. So the board published on the book is pre-WWI, and the print I have is probably a later edition made after the war, when the Weimar republic had changed the flag to the one we have now. 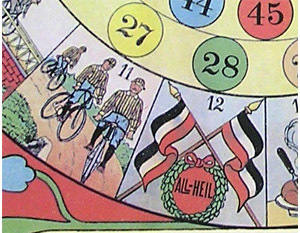 By the way, in case you wonder about the meaning of "All-Heil", it is (or used to be) the usual German greeting between cyclists. 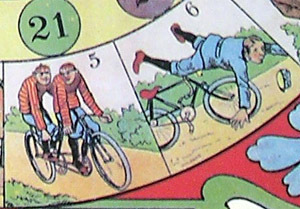 The HONGS website displays at least two versions of "De Fietswedstrijd", the Dutch version of the game (see them here and here). Both are part of multigame books. Although, unfortunately, the sizes of the games are not specified, they are very similar to the bigger german game, as you can see. The most important difference is square 12, which has a different flag (one different in each game), and of which the legend "All-Heil" has been removed. The one on the left board below is the flag used by the german territory of Würtemberg before 1945, the other is from West Prussia. This raises a few questions: Why would the Dutch versions of the game use German flags instead of replacing them with their own tricolor flag? My guess is that it was for financial reasons, which would prove the German origin of the game. But then there should exist German versions of the games with these same flags. 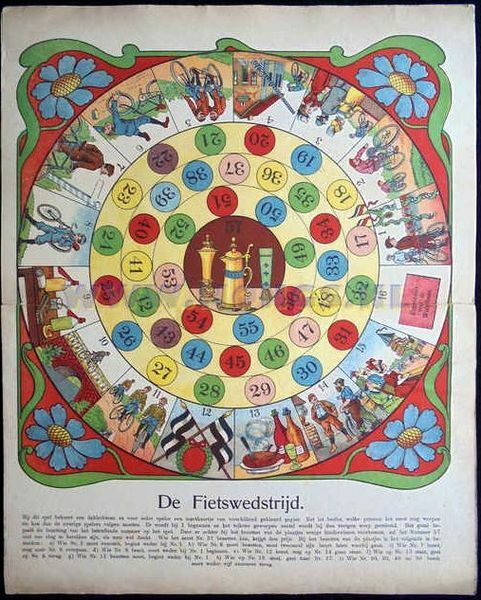 By the way, the HONGS website dates the games from around 1905-1910.